“I don’t like spiders,” my son says, glancing down at me with a look that communicates more than a trivial dislike. I often call him Bug, because as a boy, he had a little bug-nose. Now, his tattooed deltoids are at my eye level as we stand side by side in the mudroom, looking up at two mysterious round sacs attached to the tiniest web in a high corner. “You know, any day now those things are gonna hatch and millions of spiders are gonna be all over the place,” he warns. “Well, I don’t like spiders either,” I say, giving him a look meant to convey that he is the warrior of the house and should take care of the spiders, and that I am his poor weak mother who keeps the refrigerator stocked with food. Most of the time. A few hours later he has purchased munitions at Wegmans, fumigated the room with Raid Max, and captured the threatening cocoons in a bundle of multiple plastic bags that is now mine to dispose of. “You can spray the outside of the house so they don’t come in,” he says, pointing to a huge unopened can of Bug Barrier. It feels like a fair solution to the spider problem. Over half a century ago, my sister and I used to flip a coin or something to decide who was to kill the spider and who was to remove the carcass from the wall. That had seemed fair too at the time. Well, maybe not for the spiders. Getting rid of bugs is just a yucky job. But a day later, when I get an email with a link for National Moth Week and Moth Night, presented by the manager of the Cornell University Insect Collection at a local park, I decide it is time to consider changing my attitude towards creepy-crawly insects. 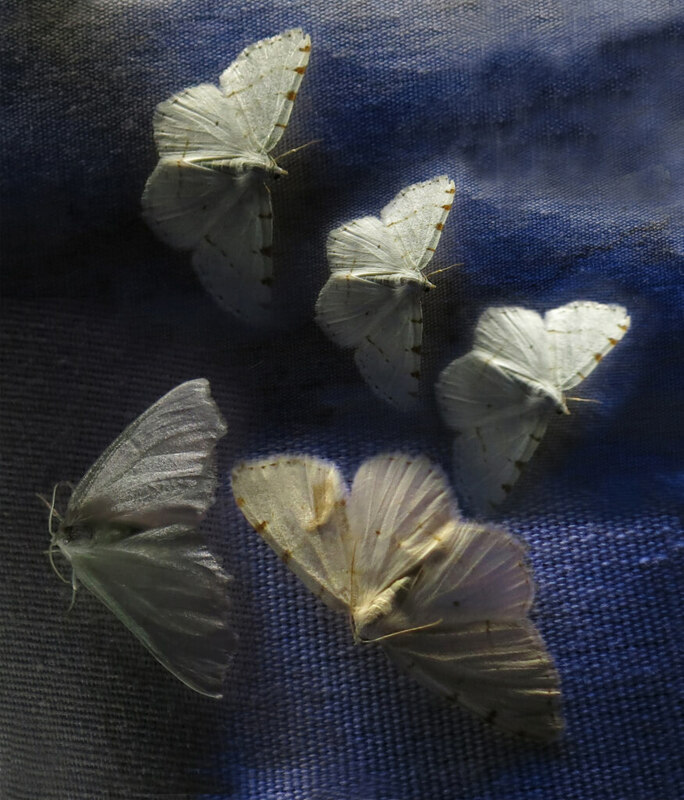 A party for moths. Maybe I can learn to live in peace with the bugs in my life. After all, anything’s possible – even joy. This entry was posted in 2015 and tagged bug love, Cornell University Bug Collection, fear of spiders, learning to live with bugs, moth night, overcoming fear of bugs, spiders on 2015/07/06 by Robin Botie. Spiders are cool, even without reading Charlotte’s web :-). They know just where to put their amazing webs to catch all the little bugs that get in through my screens. Now ticks, mosquitos, deer and horse flies had better not get near me! Okay, I think I’m getting with the program now. Spiders should not be killed. And insecticides are definitely not to be used. Spiders can take care of the little bugs that dare to come into the house. But ticks, mosquitos, deerflies, and horseflies – I can smash them if they invade my body or home. But capture and removal would be the kinder thing to do. Emily, I’m glad we agree about the ticks and mosquitos that better not get near. Cheers! Your writing really shines forth in this essay, Robin! I love the description of your unstated communications. I don’t like those insecticides, though. You can just capture the invaders and relocate them to a more acceptable home. The insecticides are bad for humans and the environment. The capture and release program is the most humane and safe, but of the two options you describe, I like the one you and your sister developed! Thanks, Suzanne. Somehow, in the thick of emotions like fear and disgust, and whatever it is one feels when their home has been invaded, the idea of simply removing the problem doesn’t always surface. But you are right. Bugs. What’s the big deal? They’re entitled to a life too. I’m sorry to anyone I’ve offended, and to all the insects I’ve destroyed. I hate insecticides myself and never use them when I hike. Capture and release. I’m going to try to remember this. Cheers! Finding joy is a full time job. It is. But it can get you out of bed in the mornings, and out of the house, and into the world with a good attitude. Cheers, Susan.